This document briefly explains the concept of ADFS (Active Directory Federation Services) and how to configure a jetNEXUS ALB-X to load balance ADFS traffic. This is particularly useful for running an hybrid exchange setup with Office 365. Increasingly enterprises are moving to cloud-based services such as Office 365. Microsoft’s Active Directory Federation Services (ADFS) solution provides seamless access to resources outside the enterprise. To ensure high-availability, performance and scalability jetNEXUS ALB-X can be deployed to load balance the Internal AD FS Servers and the Proxy AD FS Servers. 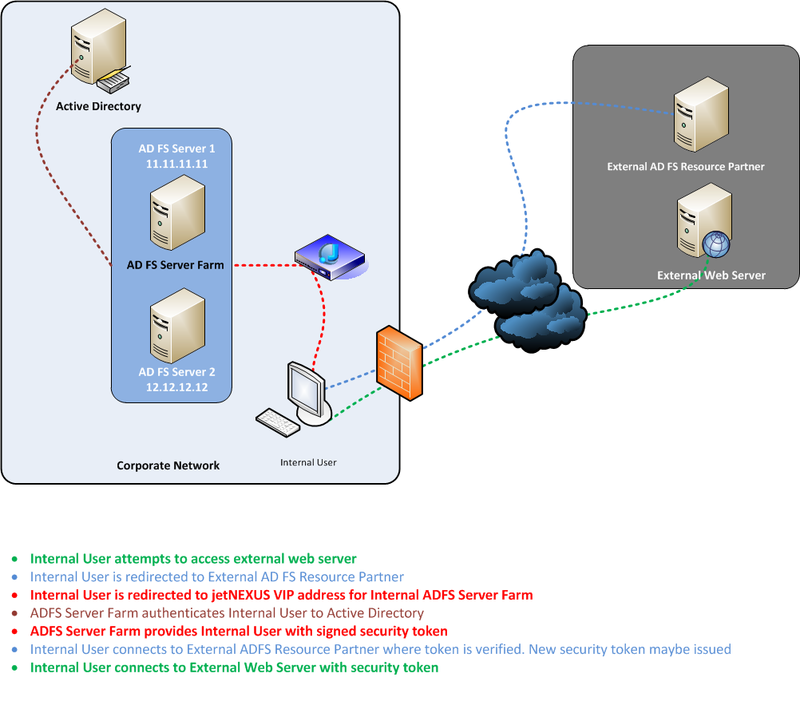 AD FS is a server role in Windows Server 2008, 2012, 2012 R2 and 2018 that provides Web single-sign-on (SSO) technologies to authenticate a user to multiple Web applications over the life of a single online session. The Internal Server Farm authenticates users to the Active Directory and provides the user with a signed security token and a set of claims for the external ADFS resource partner. 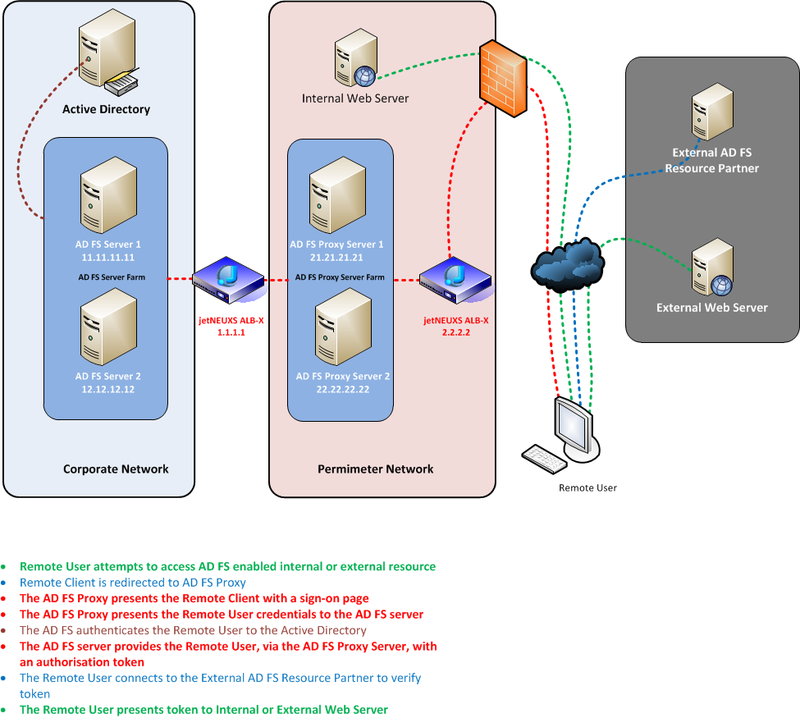 AD FS proxy servers are deployed on your perimeter network for remote internal users to access the ADFS farm from the internet without exposing the ADFS servers to the outside. To ensure high-availability, performance and scalability jetNEXUS ALB-X can be deployed to load balance two or more ADFS proxy servers. This server resides in the resource partner organisation. Its role is to issue security tokens to users based on a security token that is issued by the Internal AD Federation Server. It is assumed that you have configured the jetNEXUS ALB-X sufficiently enough to be able to access the web console GUI. If you need assistance please refer to the jetNEXUS ALB-X Installation Manual located in your download zip file or contact support@edgenexus.io for the latest copy. It is also assumed that the ADFS Proxy Server Farm has been deployed and configured as per the Microsoft deployment guide. There are two options for SSL with the ADFS Proxy Server Farm that can be provisioned with the jetNEXUS ALB-X. SSL Bridging: If the client connectivity benefits from compression and layer 7 server health monitoring then this method is available. SSL certificate must be installed on the jetNEXUS ALB-X appliance. 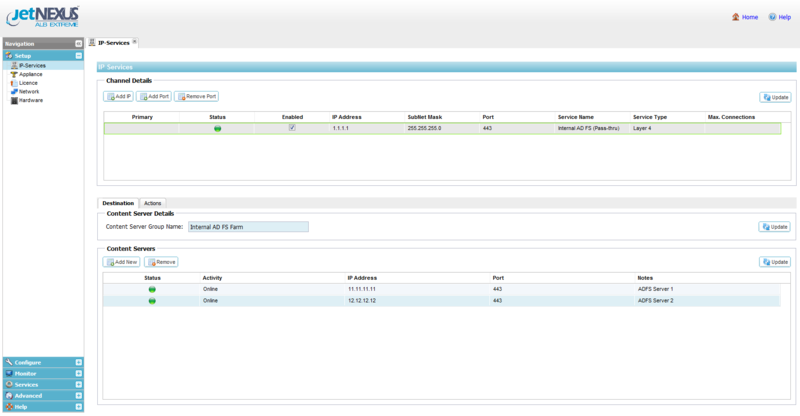 First we need to add a Virtual IP Address that will represent our AD FS servers. Select “Managed” from the drop down list. This means the ALB-X is acting as a reverse proxy. If you need assistance please refer to the jetNEXUS ALB-X Installation guide. SSL Bridging: If the client connectivity benefits from compression and layer 7 health checking then this method is available. SSL certificate must be installed on the jetNEXUS ALB-X appliance. First we need to add a Virtual IP Address that will represent our AD FS proxy servers. As this deployment is using SSL Bridging we have chosen our “default” certificate. See diagram 3.1. You can choose your own certificate once it has been imported or created. Please refer to the user manual to add your own custom certificates to the jetNEXUS ALB-X.